Doreen took me for a quick weekend to Vienna for my birthday. 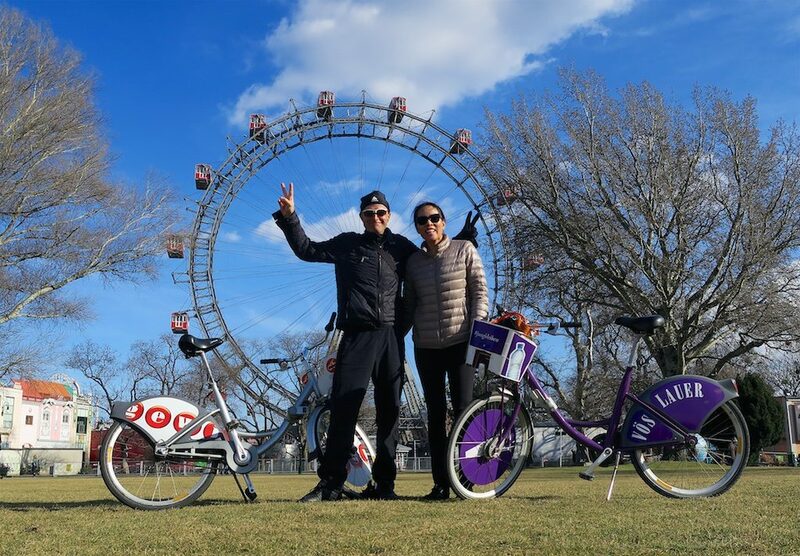 We explored the city using their bike-share program managing two rides: 40 kms and 30 kms. 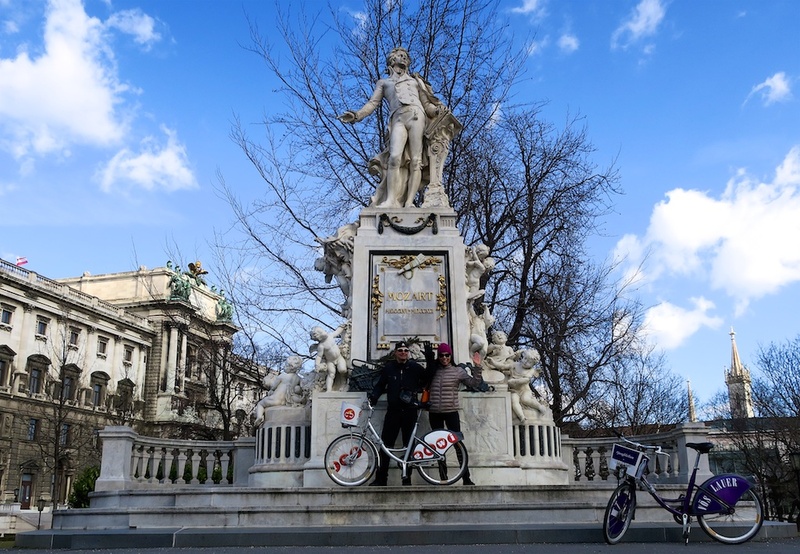 This is our sixth “city-bike weekend” in a big European city. 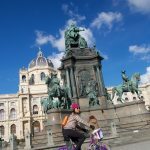 I would rate Vienna as an excellent place to visit on a bike. The other five with links to details – Excellent: Paris, Torino, and Berlin. Good: London. Better without a bike: Rome. 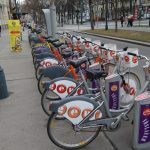 Vienna’s bike-share program and cycling infrastructure are superb. Bike paths everywhere. Bike lanes throughout the city, often well separated from traffic. 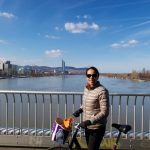 Several bike-only bridges across the Danube, etc. Brilliant. We visited some of the obvious tourist sites like Parliament, the Opera, Rathuas (city hall), etc. 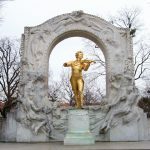 as well as some of the more famous monuments (Mozart, Strauss, Goethe, Freud, etc. 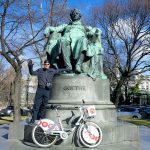 – see photos and our two routes on the map below. 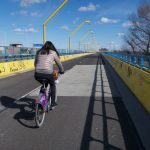 The ring road is perfect for exploring by bike within the city – there are dedicated bike lanes and many famous sites along it. 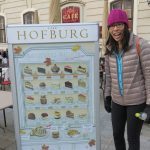 But for the centre of the city, we went on foot, enjoying the many pedestrian-only streets while visiting places likes Saint Stephen’s Cathedral (Domkirche St. Stephan). 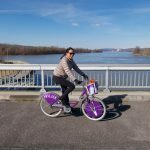 But the most fun – from a cycling perspective – was riding down to the Danube (Donau) River. 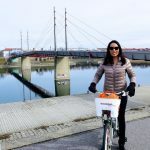 There are wonderful bike paths along both sides of the river, and even better is the long skinny island – Donauinsel (Danube Island) – that runs for perhaps 20 kilometres. 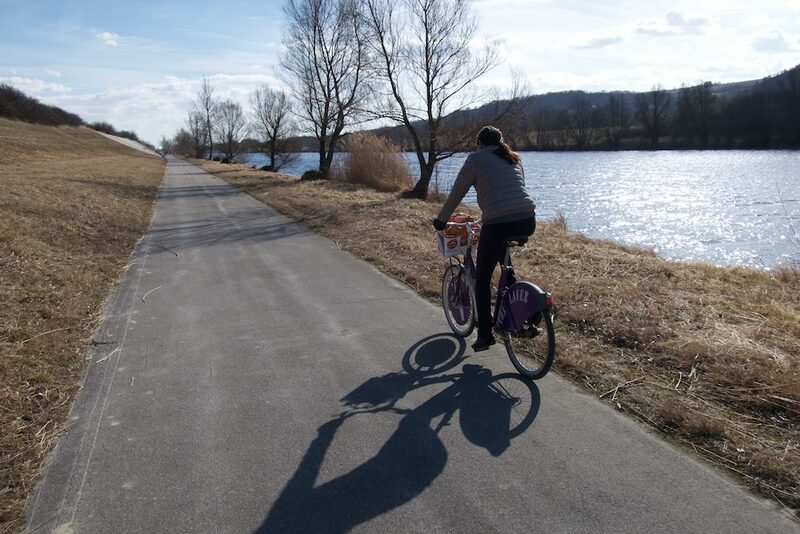 Much of it is completely undeveloped and it has perfectly paved bike paths … no cars at all. We regretted not bringing a picnic. We had a lot of fun. 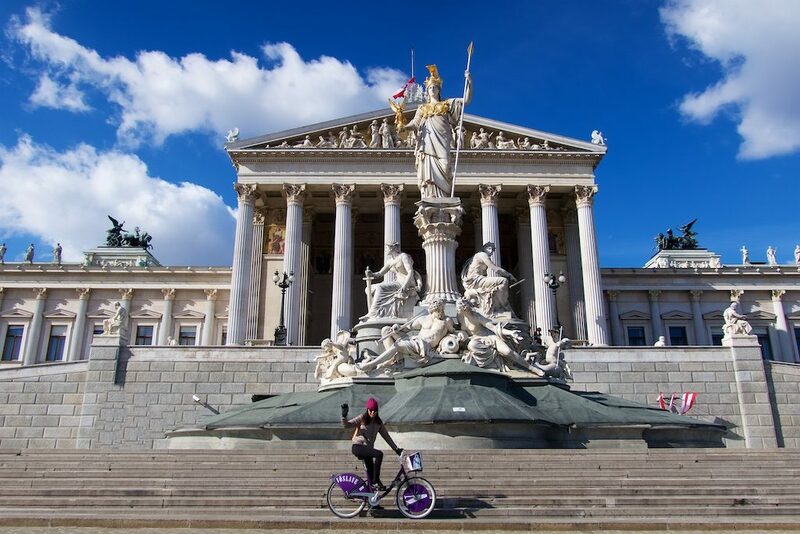 Vienna is a beautiful city full of impressive buildings and great cafés. Our only problem? 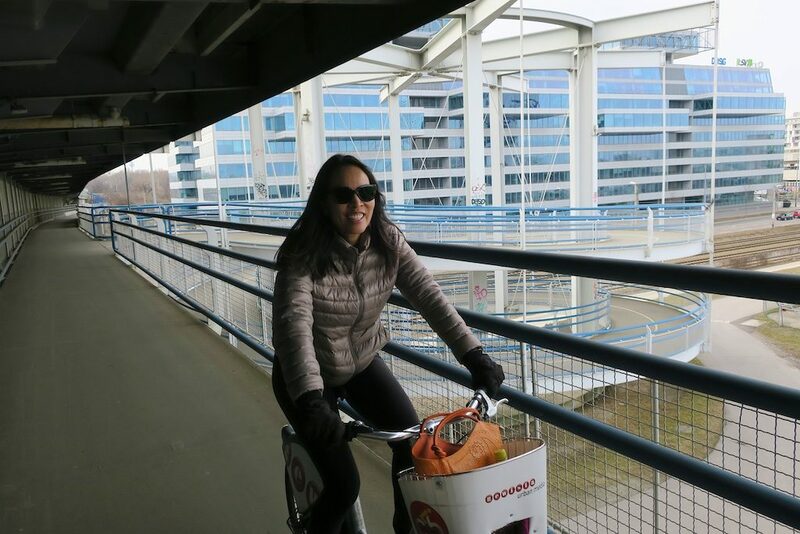 After our final ride, before going to the airport, we struggled to find a station with empty docking stations. Three full stations in a row. I would happily recommend both loops on the map below, but I’ve marked a section on the bottom right – a bike-only road – that is better skipped as it runs beside the auto-route in an industrial area. 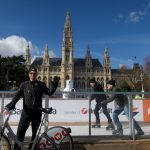 Thanks for sharing that awesome Vienna. 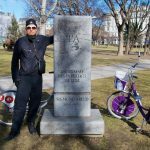 The streets, roads, statues, and the scenes all together can make a trip memorable. 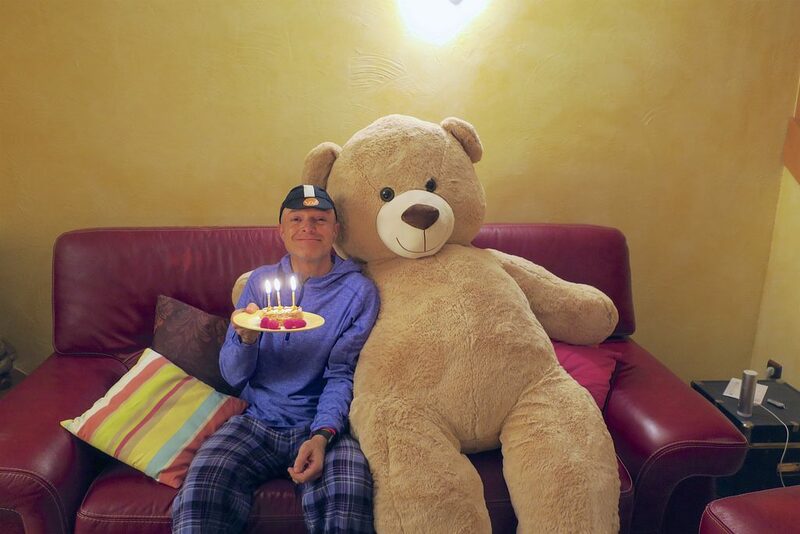 I am loving your blog. The way you map a travel, thanks buddy.